KIEV, Ukraine -- Russia has, in effect, already invaded eastern Ukraine. The question is how the West will respond. A “Non-Linear” war, explains Natan Dubovitsky, a writer, is how states are likely to fight each other in future — if they do not already. Individual regions or cities will form temporary coalitions, only to split apart in mid-fighting and find new allies. Each force has its own aims, and these too can be fluid. The war has many components, of which battle is only one element. Mr Dubovitsky’s idea was featured in a short story published in March, as Russian forces were seizing control of Crimea. Its most telling detail is the author’s real identity: Vladislav Surkov, a long-standing ideological adviser to Russia’s president, Vladimir Putin. Surkov’s tale is a fanciful exercise, but it is also as good a blueprint as any for the Kremlin’s efforts to direct the war in eastern Ukraine. After a ten-day ceasefire that was widely ignored, fierce fighting resumed in eastern Ukraine on July 1st. Both sides have suffered heavy losses. Pro-Kiev forces have resumed shelling with heavy artillery, including of civilian areas. 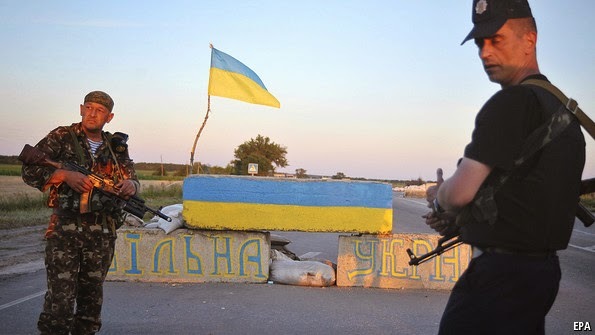 The Ukrainian army claims to have recaptured a border post with Russia — a necessary step if it is to encircle and gradually wear down the pro-Russian rebels. In recent days Ukraine’s president, Petro Poroshenko, has come under intense pressure not to extend the temporary ceasefire that Putin persistently and disingenuously calls for. A growing nationalist lobby in Kiev is pushing to continue the fight instead. With anti-government militias observing the ceasefire either fitfully or not at all, Mr Poroshenko may have reasoned that only the rebels were benefiting from breaks in the conflict. For his part, Putin appears, at least for now, to have ruled out a full-frontal invasion. On June 24th he theatrically instructed the ever-loyal upper house of parliament to cancel the authorisation for military force in Ukraine that he had ordered up in early March. The move was largely an empty fob to Mr Poroshenko and another way to ward off more Western sanctions. Yet even if a tanks-and-soldiers invasion seems unlikely, a Russian invasion of another sort began long ago: one that resembles the slippery, post-modern war described by Surkov. The nature of the incursion speaks volumes for the reach of the Russian state under Putin. Today’s Russia thinks of itself as a mobilisation state, ready to deploy a full array of instruments in a crisis. In Ukraine this means a policy that combines covert arms transfers, volunteer fighters called up by patriotic organisations, oligarchs and others, propaganda produced by state-run media, punitive arm-twisting over gas prices and a worsening of political repression at home. Officials in Moscow, who have taken to praising the non-linear war even if they do not use the precise term, say they are wielding the same tools the Americans use all the time: first engineer protests, and if that doesn’t work, back them up by force. The advantage of such an approach is “plausible deniability,” explains Dmitry Gorenburg of CNA Corporation, a policy and security think-tank. Above all, it helps Russia to avoid a new round of American and European sanctions, which would aim not just at individuals but at entire industries. Existing sanctions and the fears of more to come have already had a “chilling effect” on investment, according to the IMF, which now says that Russian GDP growth will be zero this year. The murkiness and obfuscation of Putin’s non-linear war in Ukraine also complicate Western diplomacy, dividing opinion and making it harder to find consensus. What Putin would really like is a conflict of just the right size: big enough to force Mr Poroshenko into concessions but not so large it drags Russia in directly or forces it to subsidise Ukraine’s eastern regions. As Mr Gorenburg explains, Putin will facilitate the transfer of Russian arms, fighters and money so as to ensure that “the insurgency isn’t defeated, but while doing the minimum possible”. Putin’s apparent interest in an on-again, off-again cycle of ceasefires and negotiations suggests that he would like to lock the conflict in place, legitimising the so-called people’s republics in Donetsk and Luhansk and raising the profile of these rebel commanders ready to take orders from Moscow. Such a war—oscillating between open fighting and political talks, but without ever being completely resolved — would resemble other frozen conflicts around the former Soviet Union. In Abkhazia, South Ossetia and Transdniestria, unsettled but largely bloodless conflicts serve to constrain the Georgian and Moldovan governments as well as providing a built-in lever for Russian meddling. Putin may welcome something similar in eastern Ukraine. But those earlier conflicts differ in one important aspect: they are based on genuine, deeply felt ethnic and religious cleavages. Although plenty of Russian-speakers in Donetsk and Luhansk resent Kiev and would like more autonomy, such Balkan-like divisions do not really exist in Ukraine. A more likely outcome is warlordism, or the rise of authorities who rely for their position not on ideology but on “force and patronage,” explains Kimberly Marten at Columbia University. Warlords, Ms Marten says, use violence and bribery to exert control over territory and money flows — the sort of informal politics that Moscow knows well. In conflict zones like eastern Ukraine, those who enjoy access to resources naturally see their influence rise. The Kremlin’s preferred intermediaries — men like Alexander Borodai, a Russian public-relations manager and political consultant who is now prime minister of Donetsk’s “people’s republic” — have become ever more prominent. The question for Putin is how far he is willing to go if Ukrainian forces seem to be gaining the upper hand over the rebels. In a pure military contest Kiev is likely to prevail, given enough time. “Even just standing still will require Russia to put in more resources,” says Mark Galeotti of New York University. Putin may not be able to avoid this. Igor Korotchenko, a military analyst and editor who is close to the defence ministry, argues that Russia should step up its support to anti-Kiev forces following the precedent of America’s support to Syria’s rebels. The question for the West is how much of an appetite it has for thougher measures. The recent cycle of threats of more sanctions, followed by meek postponements, does not bode well. There should be no more ceasefires until full disarmament by separatists. Ukraine should use every thing it has to wipe out all armed pro-Russian fighters from Ukrainian land, ones and for all. It is totally useless to ask president Putin to use its influence on fighters in Eastern Ukraine, West must proceed with new and serious sanctions, if they are trying to help for real. Verhovna Rada of Ukraine should find the way and create conditions for foreign investors to participate in reconstruction of it's Gas Transportation System.